Notes: Matt Miles designed this pattern and it was introduced by Umpqua Feather Merchants within their catalog in 2014. Matt guides out of his home state of Virginia but spent many years working with Pat Dorsey at Blue Quill Angler in Evergreen, Colorado. Besides having a realistic silouette, this pattern floats within the surface film as the foam thorax has sufficient floatation to support the pattern. The rear of the hook rides deeper within the film much like a female depositing eggs. The rubber legs provide plenty of action as the females would in skimming the surface. 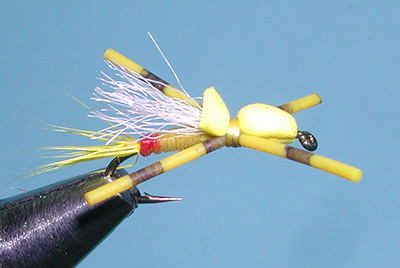 Like many guide flies, this pattern has only a few materials and is a relatively simple pattern to tie. The pattern is often fished within riffle breaks with a dose of Dry Fly powder every now and then due to the poor buoyancy that is designed within this fly. The added attraction to this fly is that you can't stop humming Lou Reed's Ride Sally Ride while fishing.